Katherine began racing and training competitively in 2004, since then Katherine has emerged as one of Canada's top distance runners. She has completed 7 marathons and taken 31 minutes off her first marathon. 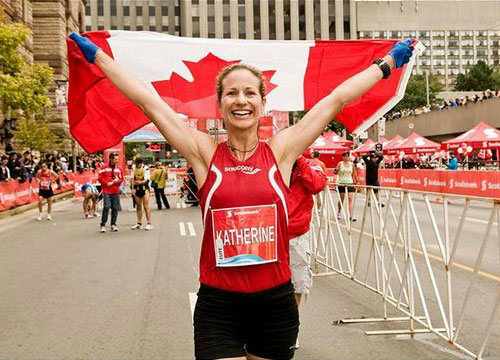 Katherine placed second in the 2009 Royal Victoria Marathon in a PB time of 2:47:27 in 2010 & 2011 she finished 1st Canadian Overall in Scotiabank Toronto Waterfront Marathon. Katherine began practicing and teaching yoga 11 years ago. She feels that yoga is a beautiful balance with any sport. Katherine helps students understand that balance, flexibility and strength are key components to staying injury free. She teaches that the breath and meditation that you practice in yoga will help calm the body and mind in tough training sessions and life.